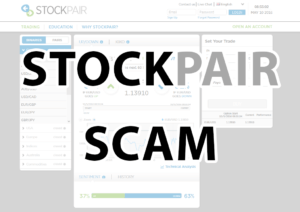 Home » Binary Options Brokers » Is Stockpair a Scam? Alert: This article is not relevant anymore. On November 4th 2017, the broker Stockpair has been closed. Please, choose a different broker from our Brokers Section. Thank you. Stockpair isn’t as well known as for example Banc de Binary, which is the reason why there’s not so much to be found about it online. Stockpair, according to statitics, has about 20 % of the clients that Banc de Binary has (statistics from May 2016). But it is still very simple to tell whether Stockpair is a SCAM or not. Read on to find the answer! We have looked deep into stockpair and verified it ourselves by countless deposits and withdrawals. Even our readers are very satisfied. Why is Stockpair a scam? To be honest, I have not even found any specific evidence why Stockpair should be a scam. I trade with them myself and I have been trading with them for the past 2 years. And I’ve never had a single problem. All withdrawals are always sent fast. Even amounts of $1.000 – $2.000 are always sent promptly and they will by in your account within days. A trading bonus shall be added to the free balance of the client account and is redeemable only once a trading volume of 40 times the value of the bonus has been executed. Trading a volume below these terms may not, under any circumstance, be redeemable and may be returned to Stockpair. 1) The bonus shall be cancelled. 2) In the case of trading loses, all losses will be borne by the original deposit and the remaining balance may be withdrawn. 3)In the case of trading profits, the trading profits shall be cancelled and the original deposit may be withdrawn. Binary Options Broker Stockpair is not a scam. They have been verified by countless regulatory authorities all around the world, including the English FCA, French AMF or Italian CONSOB. 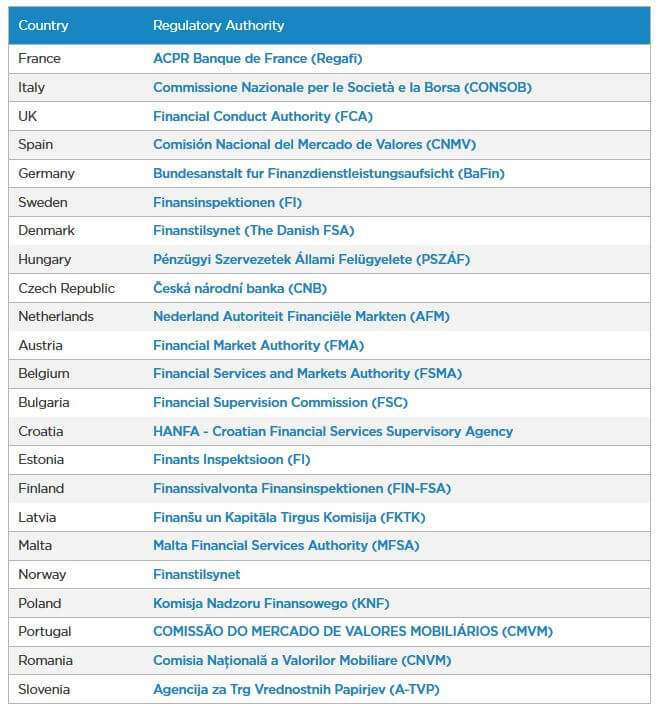 Full list of regulatory authorities which have approved Stockpair can be found on their official website. We made a screenshot and you can see it underneath this paragraph. The list of regulatory authorities which have approved stockpair. Stockpair is the only broker operation on this platform. It is, however, not made by stockpair itself. The platform does not have a specified name, but the company that has programmed it and manages it is called TRADOLOGIC. I’m sure they have done a great job – never ever have I experienced a crash of the platform. The only thing that I don’t like are trading amounts. After a while of inactivity, the trading amount switches to $100. So make sure you always double-check how much you are investing, in order not to ruin your account! Stockpair’s platform and website are very well secured with HTTPS connection, which means all your information, such as credit card number, or other personal data is secured from anonymous hackers. It is very simple to start trading with stockpair. The first thing you need to do is to create an account. You can register now by clicking the button below. After registration process is complete, the deposit can be made with a credit card, wire transfer, skrill or other payment methods. Compared to other broker, Stockpair might be the best one. Show detailed comparation table! $10 BONUS $ 100 * Review Trade Now! 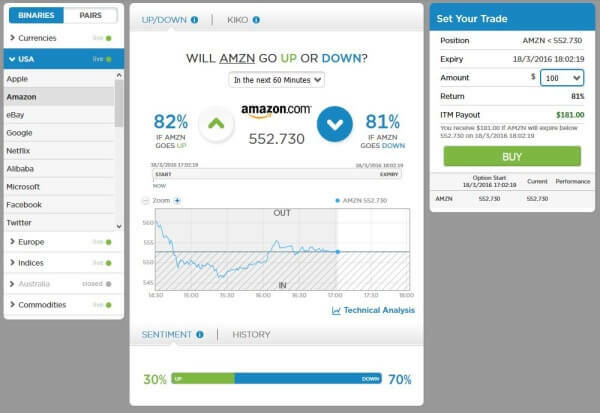 FREE DEMO ACCOUNT $ 10 82 % for Standard, 90 % for VIP accounts* Review Trade Now!